Just Who Files Bankruptcy Anyway? When I counsel people who are thinking about filing bankruptcy, I often hear that they feel alone, stranded, have never known anyone who has filed, have no one to talk with about it. It can certainly be intimidating when you think you’re the only one who has ever been in severe enough financial stress to consider seeking a discharge of those debts. In fact, bankruptcy affects all walks of life and all income levels. It affects married and single people, and age is no barrier. Seniors and those just starting out in life file bankruptcy. Statistics can often give us a picture of averages, but the actual spread is large. Let’s start with some basic figures for the numbers of cases filed, in this case for the year 2016. *These figures are taken directly from reports issued by the Administrative Office of the US Courts. The statistics are reported by each of the federal judicial districts in the 50 states, Washington, D.C., ​and territories. That allows us to compare other interesting facts, like how many people file as compared to the general population. For instance, in 2013–2014, the number of filings per 1,000 people topped 10.8 in one judicial district in Tennessee, but in the neighboring districts, the statistics show 4.3–6.8 filings per 1,000. Compare that with the Northeast and Prairie states, where the filings per 1,000 are a low 0.6–2.2 per 1,000. The blog ​Credit Slips has produced a helpful chart and list showing the filing rates in 90 federal districts. It is difficult to pinpoint why there is such a wide variation in filing rates across the country, and the Credit Slips author posits a theory or two, such as local legal culture and the presence or absence of effective debt collection laws like garnishment. View more filing statistics at the US Courts website. What Factors Lead to Personal Bankruptcy Filings? 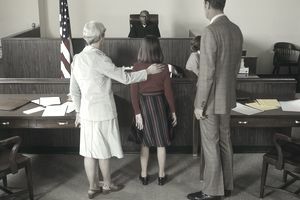 Because filing a bankruptcy case can be a huge decision with long-lasting consequences—positive and negative—people who are contemplating filing bankruptcy often want to know if their reasons for filing are typical, reasonable, or sound. A 2005 study reported that 46 percent of bankruptcies were related to medical debt. This conclusion has been borne out by other studies as well. This doesn’t mean that medical debt is the sole reason. There are lots of contributing factors and contributing debts. Click here to see an interesting chart showing the reasons as reported by the filers themselves. In addition to medical debt, leading factors that contribute to bankruptcy filings include unemployment and domestic issues like divorce. Note that most of these factors involve circumstances the filer could not control. According to this report, only 15% of filers report having to file because of actions they took and decisions they made that led to excessive credit card debt, large mortgages, or high car payments. The average filer is married, has a high school education, and makes less than $30,000 a year. In 2007, those younger than 25 made up less than 2 percent of filers. About 20 percent of filers are 55 years or older. The median age is about 45. Women are slightly more likely to file than men: 52.4 percent vs. 47.6 percent. Women make up 51% of the US population. People ages 65 and older make up about 8% of filers. Those ages 34 and younger make up about 19% of filers. Bankruptcy affects all age groups and all socioeconomic classes. In fact, it's easy to argue that there is no one "average" or typical bankruptcy filer. But if we were to build one, she would likely be a middle-aged woman, married, Caucasian, with some college, who makes less than $30,000 per year. Even so, the statistics bear out that outside circumstances more so than age, income, or educational level play a huge role in decisions to file or not file.